Scotland's Towns Week is the annual celebration of the nation's towns and city districts. Coordinated by Scotland’s Towns Partnership and Scotland's Improvement Districts, all organisations and individuals are invited to promote the ‘Keep It Local’ message, share what’s going on in their area, and highlight what makes their local communities special. This is a unique chance to collaborate, share best practice, interests and opportunities and ultimately to help bring life, vitality and vibrancy back into our town centres. Aberdeenshire town Turriff has been voted by the public as Scotland’s Most Beautiful High Street, recognising the heritage, beauty and unique experience the town centre offers. Members of the public were invited to choose from among a shortlist of entries, which also included Cupar, Denny, Inverurie, Jedburgh, and Linlithgow. Voting was very close, with Linlithgow and Inverurie being awarded 2nd and 3rd places respectively. Rose Logan, Vice Chair, Turriff Business Association, said: “On behalf of Turriff Business Association and the Turriff community, I would like to say a huge ‘thank you’ to all those who voted for us in the Scotland’s Most Beautiful High Street competition. The standard of entries was very high and we are absolutely delighted to have won this award. There is a tremendous community spirit and involvement within Turriff and the surrounding district and without their support this achievement would not have been possible”. Read more and see full results. A fresh upgrade to an innovative website providing in-depth information on Scotland’s towns has been unveiled. From greenspace to migration, new indicators on the Understanding Scottish Places (USP) platform provide additional support to all those who work for positive change in Scotland’s towns. USP is an accessible, open-access tool which allows people to view the social and economic profile of their town and compare this with other towns in Scotland. Data is included for all towns in the country with a population of above 1,000; 479 in total. The platform is created and maintained by Carnegie UK Trust, University of Stirling, Scotland’s Towns Partnership, and the Centre for Local Economic Strategies, and receives support from the Scottish Government. Storm ID are the web developers. The organisations behind USP have now unveiled the second comprehensive upgrade to the tool since its creation in 2015. In addition to the wide range of information already available, users can now access ‘environment and connectivity’ indicators such as greenspace and average internet download speed, as well as enhanced and updated population change data. This includes a measure of local migratory patterns for the first time. Read more and try out USP here. Scotland's Towns Partnership is excited to reveal the shortlisted entries for this year's FutureTown Design Competition. You can view entries and choose your favourite below. Voting will run through Scotland's Towns Week, closing 9am, Monday 26 November. The competition is aimed at stimulating conversations, provoking ideas and encouraging new approaches to highlight what our towns could look like now and in the future. The winner is chosen by the public through an online vote. See below for more information about the competition. View shortlisted entries and vote here. The publication of our special edition of ‘Scotland’s Towns’ in the Herald on Sunday (Sunday 18th November) to kick off STW, on the theme of ‘Future Industries in Scotland’s Towns’. The announcement of the winner of Scotland’s Most Beautiful High Street. Online voting to decide the winner of the FutureTown Design Competition. Launch of the upgraded Understanding Scottish Places town data tool. Regional campaigns such as the #FifeTownsRock initiative by Fife Council & partners. → Share photos of your town and tell STP what makes it unique. Take part in the conversation on Twitter at @ScotlandsTowns, #LoveMyTown and #ScotlandsTowns, or on Facebook. → Tell STP about and share any events or initiatives happening in your town during 19 - 25 November. Contact us. → Download and display the "Keep it Local" poster. → Vote for your favourite innovative idea in the FutureTown Design Competition shortlist. 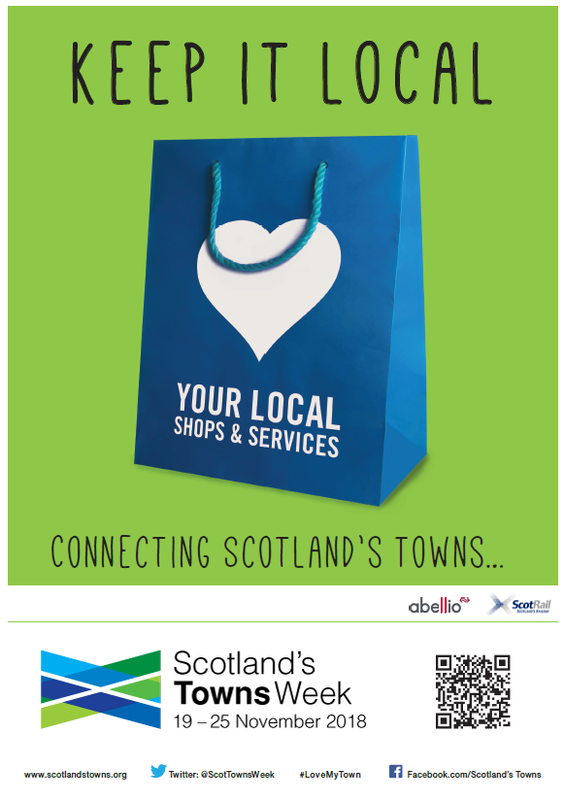 Keep in Touch and Up To Date with Scotland’s Towns Partnership!